Editors Note: I originally wrote this as an essay for my Yoga teaching course, I wonder how many people have since found it and used elements of it for their own course work? At the time of writing a lot of this seemed academic and too scientific for me to use on a daily basis. Now many years later this same essay brings home to me how important this knowledge is. Although on my yoga weekends I do not go into the technical terminology I do incorporate the factors that affect breathing and in turn our everyday health. The process in which air is drawn into the body. Do you want to live forever? This is a question Dr Erik Peper (a leading doctor in helping people to breathe in the USA) asks all his patients, when he meets them. His answer is always the same; ‘breathe in, breathe out, as long as you keep breathing in and out you can’t die’ Breathing is a process that all of us do without really thinking about it, but what does happen within the body as we draw air into the lungs? The air enters the lungs (the bronchi) and then divides into smaller passageways called secondary bronchi, these repeatedly divide and become smaller bronchioles which contain no supporting cartilage. These thin walled respiratory bronchioles end in clusters of thin walled sacs called the alveoli. The alveoli are in contact with air and blood across their thin walls, it is here that the exchange of gases by diffusion occurs. A flap of cartilage called the epiglottis guards the opening to the larynx. 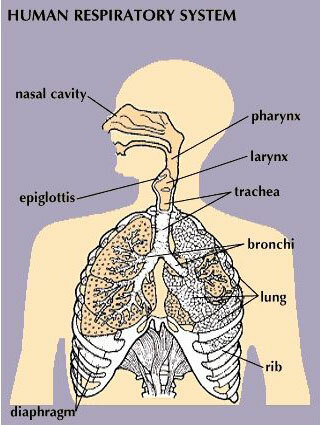 This structure prevents food from entering the respiratory passage way and directs it to the esophagus. The basic characteristics of optimal breathing are that it should be diaphragmatic, nasal, deep, smooth, even, without sound and without pause. In many ways the effects that age, gender, posture and illness have on our breathing can be interrelated with many of the factors crossing over into each category. However let us first look at age. Age: As people age, we see an increase in poor posture, with some people walking with a stoop. This can cause the restrictions in the ribcage resulting in poor expansion of the chest. People who smoke are also more prone to chronic lung disorders such as emphysema and cancer of the lung. Gender: Generally men breathe more fully and lower in the abdomen where as women breath higher from their thorax. Tight fitting clothing can also effect breathing as can pregnancy. A pregnant woman may experience breathlessness due to her baby pressing on her diaphragm and ribcage. During pregnancy the volume of blood increases in a woman’s body, which can create breathlessness. Posture: Good posture is essential for optimal breathing. Unfit people generally have less stamina resulting in shallow breathing and a tendency to strain their muscles easier. Stress can also affect posture and breathing. Anxiety before an important business presentation can result in shallow breathing and sometimes panic attacks and hyperventilation. Respiratory infections: The respiratory system is a prime candidate for infection. With its membrane-lined airways and delicate-walled alveoli it is in constant contact with airborne germs. Viral infections such as colds, flu and sore throats are experienced by all of us at sometime, the most serious of these is pneumonia. Pneumonia is an inflammation of the lungs. It makes the alveoli fill with mucus and fluid. This leads to the impairing of the gas exchange and as a result affects the functioning of the whole body. Asthma is an obstructive lung disorder (as is emphysema). The problems that arise here are that air flow through the conducting airways is obstructed or limited. With children and adolescents asthma is associated with allergic reactions to the sensitive bronchial tree, this can be from pollen, certain foods, dust, animal fur, exercise and the inhalation of cold air. The airway obstruction can also be caused by the build up of mucus in the air passages, such as with chronic bronchitis. With emphysema this is a result of the disruption and expansion of the fibrous supporting tissue around the airway.